We have some superb specials to kick off 2018 with, save £100’s off trips to the Maldives, Red Sea and Sudan. Save up to a £1000 off a bucket list trip to the Galapagos. All to be booked before the 31st January. Get your time off work sorted out and dive into 2018! 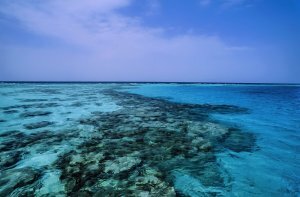 Start 2018 as you mean to go on with an adrenline fueled adventure in the Southern Red Sea. Emperor Serenity is a contemporary, spacious liveaboard where fine accommodation and service is standard. This sleek liveaboard was built in the Maldives specifically for divers. Stand out from the crowd as you moor in the picture perfect Maldivian atolls. This 40 metre boat easily accommodates 26 guests in 13 well-appointed en-suite cabins, all with air-con. There are 5 lower deck cabins, each with double beds and a single too, as well as 3 double only cabins. On the main deck cabins you find 3 cabins with double beds and a single, and the same again on the upper deck. A supplement applies for main and upper deck cabins – please do ask your travel consultant at the time of booking about which cabin option would suit you best. Includes transfers from Male airport, 7 nights full board, approx 17 fully guided dives. Sha’ab Rumi, the Con Shelf, Sanganeb and Wingate’s Umbria are some of Sudan’s finest dive sites. And the Sudan North itinerary focuses on these undeniable highlights. The walls are deep and plateaus an ideal stage for shark watching. Add to this the beautiful wreck dives at the unique Umbria and Con Shelf II and you are guaranteed an incredible Sudan liveaboard, packed with excitement and variety. Voyager is operated by an experienced team who have made the Sudan their home and know each reef intimately – there is no one better to guide you through the Sudanese waters. With such an unparalleled knowledge of the dive sites, marine species, their seasonality it is no wonder that divers flock back to this vessel year after year. Exotic Resort Malapscua are the original pioneering dive centre – get closer to thresher sharks and enjoy the warm welcome at this beach front resort, the Island has an impressive reputation for such a small location. The diving in Malapascua is most famous for its thresher sharks. With their wealth of experience, the Exotic Resort has an exceptional track record at getting the best sightings of these elusive and shy sharks. Step ashore and forget your everyday stresses and strains. Take in the crystal turquoise waters that surround the Exotic resort and relax into a slower pace of life. Includes flights, transfers, 7 nights full board plus 10 boat dives. 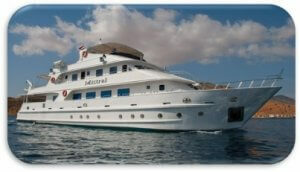 Humboldt Explorer is a one of a kind of Galapagos liveaboard. There is plenty of space on board for relaxing in between dives. The sun deck has a large lounge, as well as a partially covered sun deck and jacuzzi. Building on their experience diving this one of a kind destination, they have crafted a very special itinerary that focuses on extra dive time at Wolf and Darwin.This means you have even more time to dive with the famous hammerheads, Galapagos sharks and silkies. Add to this the seasonal whalesharks and rays sightings as well as iguanas and sea lions, and you can see just why the Galapagos is one of the ultimate diving destinations.